Turtles were traditionally decapitated. But since they became protected in 1999, ceremonies in many temples [not all temples, but some] have changed with turtles being symbolically sacrificed through their release to the sea alive. Indonesia has rejected a push by the resort island of Bali for rare turtles to be legally slain in Hindu ceremonies, siding with conservationists of the protected reptiles against religious advocates, an official said Friday. 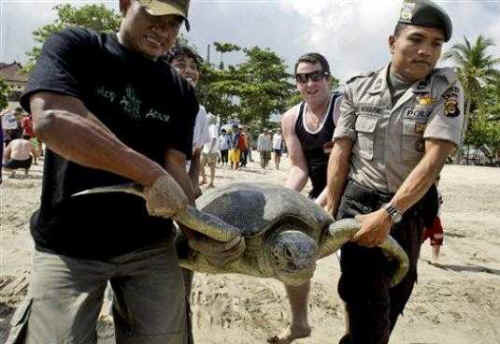 In this May 2008 photo, an Indonesian police officer and tourists carry a sea turtle to release it into the ocean on Kuta beach, Bali, Indonesia. Indonesia has rejected a push by the resort island of Bali for rare turtles to be legally slain in Hindu ceremonies, siding with conservationists of the protected reptiles against religious advocates, an official said Friday, Nov. 27, 2009. Bali Governor I Made Mangku Pastika enraged environmentalists by advocating a quota of 1,000 green turtles be killed each year, strictly for ceremonial purposes. He said legally killed turtles should not end up in cooking pots, served to tourists in restaurants as soup or turtle skewers as they had in the past. "It would be supervised tightly, and any violation would have to punished," Pastika told reporters in Denpasar, Bali, on Wednesday. Turtle meat is a traditional delicacy in Bali, the only province with a Hindu majority in Indonesia's Muslim-dominated archipelago. But Indonesia banned the turtle trade and consumption a decade ago amid international concerns about the endangered species' dwindling numbers and threats by animal welfare groups of a tourist boycott of Bali. Masyud, a spokesman for the Forestry Ministry which is also responsible for animal conservation, said Friday the governor's request for a Bali exemption from national protection laws was recently rejected on scientific advice. "The law clearly mandates it was not possible, that the green turtles are included in the animals listed for protection," said Masyud, who like many Indonesians uses only one name. Tens of thousands of green turtles nest on Indonesia's coasts, but sites have dwindled because of poaching and development. Conservationist generally respect the Hindus' need for turtles in rituals, but railed against the number proposed. Wayan Geria, coordinator of the Turtle Education and Conservation Center at Bali, described the quota plan as an embarrassment to protection efforts. Creusa Hitipeuw, coordinator of the Indonesia turtle program of the World Wildlife Fund, said introducing such a high quota could trigger large-scale illegal trade and consumption. "We recognize the need for the use of turtles in a ceremony, but it has to be managed well," she said. "What we are afraid of is the commercial trade. It's a death trap for this kind of population." Bali Hindu Faith Council head Ngurah Sudiana called for Jakarta to approve a smaller quota. "The central government should understand the need for green turtles as part of traditional ceremonies because it relates to our faith," Sudiana said. "Prohibiting it will hurt Balinese people." Up to five turtles are needed for sacrifice at each of the 100 to 150 large ceremonies a year in Hindu temples around Bali, he said. Turtles were traditionally decapitated. But since they became protected in 1999, ceremonies in many temples have changed with turtles being symbolically sacrificed through their release to the sea alive.